Multilayer modular flooring products are the trendsetter among floor coverings in residential and project flooring. They are quick and easy to lay, offer a multitude of individual design opportunities and are good value for money. Your dealer will tell you which is the right type of multilayer modular flooring for your requirements. Make the most of his knowledge and seek his advice. The product structure is the decisive factor determining the performance of each MMF product. Numerous variations allow users to select varying degrees of elasticity ranging from semi-rigid cores to fully elastic planks, and thus achieve a broad spectrum of potential applications in both the contract and private sectors. Core layers can be wood composites such as HDF or cork, but also polymer or polymer composite materials such as PFC (Perfluorcarbone), natural fibre-reinforced plastics, WPC (Wood Plastic Composite), EPC (Expanded Polymer Core) and SPC (Solid Polymer Core); but also mineral-based substrates, e.g. MPC (“Mineral Plastic Composites”). 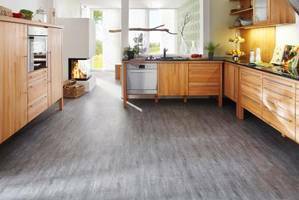 There is a broad range of formats available from tile formats to extra long and extra large planks. Depending on which type of underlay is being selected, the overall system structure thickness is between 4 and 20 mm. Contemplating their surface materials and properties, MMF flooring does not entirely differ from other elastic flooring. Therefore, numerous instructions and directions for multilayer modular flooring can be compared with the relevant notes and user guides for the elastic flooring product group. Normally, hybrid or modular multilayer flooring (MMF) feature highest quality and durable surfaces which ensure the long life of such type of flooring – professional cleaning and care corresponding to use provided.